Six Palestinians were injured and two Israeli peace activists were detained as protests against the Israeli occupation broke out in at least four villages across the West Bank on Friday. 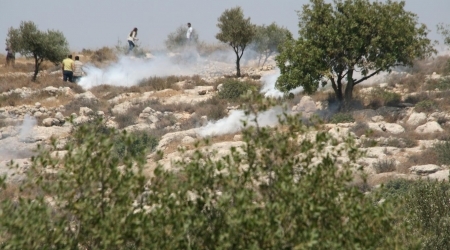 Dozens of Palestinians also suffered from excessive tear gas inhalation during the clashes, which took place in al-Ram, Kafr Qaddum, Bilin, and Beit Ummar. 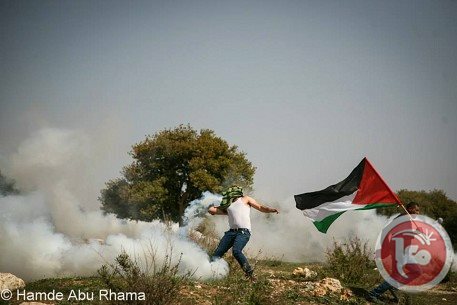 Four Palestinian youths were injured and dozens suffered from excessive tear gas inhalation in clashes with Israeli forces at the northern entrance of al-Ram village on Friday. Palestinians threw stones and empty bottles while Israeli forces fired rubber-coated steel bullets, tear gas and stun grenades at them. An Israeli police spokeswoman did not immediately return calls seeking comment. Two were injured after Israeli forces opened fire on dozens of protesters demonstrating against the Israeli separation wall and authorities' confiscation of village lands in Bilin. One protester who shot with a rubber bullet in the leg and the other was shot in the neck by a tear gas canister during the demonstration, organizers said. During the protest, several activists climbed the wall and planted Palestinian flags atop it, and they also tried damage motion detector cables on the top of the wall. Israeli forces chased protesters into the village and fired a large amount of tear gas against protesters, causing a number of cases of excessive inhalation. Israeli forces on Friday detained two Israeli peace activists following the weekly protest against the Israeli occupation in Kafr Qaddum. Dozens were injured from excessive tear gas inhalation after clashes broke out with Israeli protesters following the protest. An Israeli activist said that a photographer named Hagar and an activist named Gilad were detained at a flying checkpoint as they left the village in a car with an Israeli license. Hundreds had participated in the protest which began after the Friday noon prayers. Clashes also broke out in Beit Ummar in the southern West Bank on Friday, after Israeli blocked the main road leading into the village. 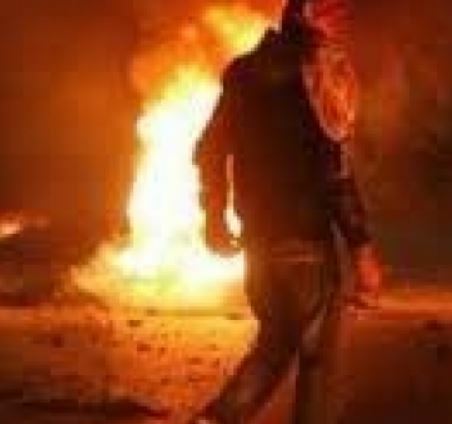 Spokesman for the popular resistance committee in Beit Ummar Mohammad Ayyad Awad said that clashes broke out in the village and dozens suffered from excessive tear gas inhalation as result. The injured were all treated on the scene by red crescent medics, Awad added. Israeli settlers in the West Bank stoned the car of a Palestinian photographer working for AFP, slightly injuring him, as he was on his way to cover a story Friday. The photographer said several of around 100 settlers who were gathered at the side of the road threw stones at his car, cracking the windscreen and lightly injuring him in the face and hands. Israeli soldiers on the scene did not intervene, he added. In photographs of the incident, four settlers are seen running, three of them with pistols. Another shows the settlers stoning the car while the soldiers watched. After the attack, soldiers moved the settlers on. He and other journalists in a separate vehicle were on their way to cover Palestinian demonstrations in the nearby Jalazun refugee camp, north of the West Bank administrative center of Ramallah. The AFP photographer, Abbas Momani, said he planned to file a complaint with Israeli police, while the Foreign Press Association said its lawyer would also look into the case. 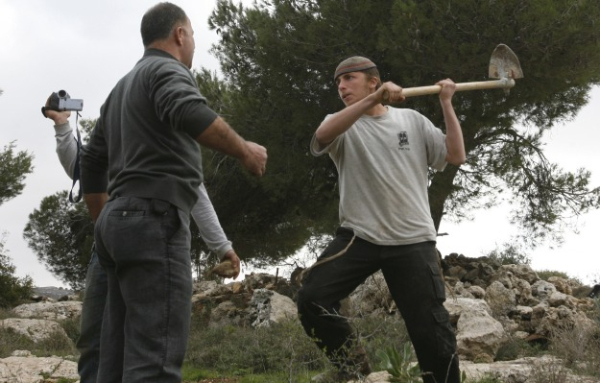 Jewish settlers often attack Palestinian cars, the same way as Palestinian youths stone Israeli vehicles near Jewish settlements in the West Bank. Israeli policemen beat up a student at Qatanin gate of the Aqsa Mosque in occupied Jerusalem on Thursday while Jewish settlers were allowed free access into the holy Islamic site. The Aqsa Foundation for Endowment and Heritage said in a statement that student Khalil Suwan, from occupied Jerusalem, was badly bruised in the incident. The police story claimed that Suwan refused to give his identity card to the policemen before entering the Aqsa Mosque, AFEH said. It pointed out that at the same time 64 Jewish settlers and students were allowed free access into the Aqsa Mosque with full police protection. 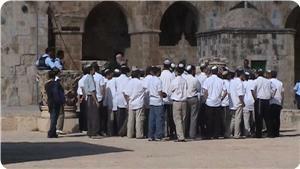 The foundation said that rabbis accompanied the group and gave explanations on history of the alleged temple. It said that Israeli intelligence officers provocatively toured the Mosque and took photos of Quran students. Israeli police officers assaulted a Palestinian man from Jerusalem on Thursday morning after he tried to enter the Al-Aqsa Mosque compound, witnesses said. Eyewitnesses told Ma'an that Israeli police officers stationed at the Cotton Merchants' Gate engaged in a heated argument with 42-year-old Khalil Suwwa as he was trying to enter the compound, where he studies Islamic law. They added that the police officers "brutally attacked" Suwwa during the argument, and the man fainted after sustaining bruises all over his body. 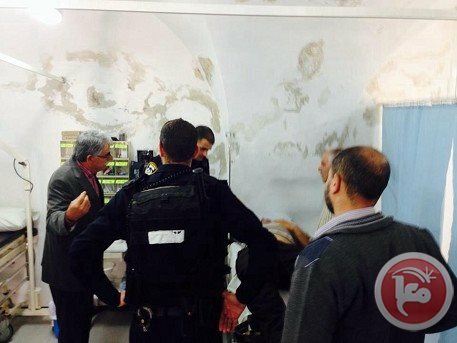 The witnesses added that Israeli police officers did not allow medics to offer first aid to Suwwan, and after he was evacuated to a clinic inside the Al-Aqsa compound Israeli officers stormed the compound and attempted to detain him. Suwwan was eventually evacuated to a hospital but only after the Israeli officers seized his identity card, the witnesses added. An Israeli police spokesperson did not have any information regarding the incident. Three young Palestinians were severely injured after a number of extremist settlers brutally assaulted them near al-Mughair village, northeast of Ramallah on Thursday morning. 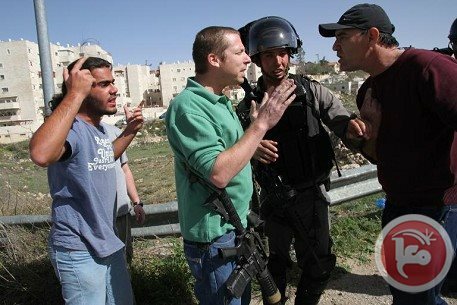 Head of al-Mughair village council, Faraj Na'san, told PNN that a group of settlers from a nearby illegal settlement attacked the two brothers As'ad and Thiab Na'san and the youngster Haytham Ghaleb Haj Mohammed, adding that the latter suffered head injury and that his health condition was described as "dangerous". Israeli occupation forces assaulted 18-year-old Omar Tawfiq Daraghmeh from Tubas, while arresting him. He was severely beaten on hands and head. Lawyer of the Palestinian Prisoners Society (PPS) said that the Hawarah prison's administration refused to admit the detainee Daraghmeh to prison due to his serious health condition. The lawyer added that the cloths of the detainee were soaked in blood and that he suffered bruises in his face and right eye. Israel's army said Wednesday it struck two members of the Lebanese militant group Hezbollah as they tried to plant a bomb near the Israeli-Syrian border. "Earlier today, two Hezbollah-affiliated terrorists were identified attempting to plant an explosive device near the Israel-Syria border in the northern Golan Heights. 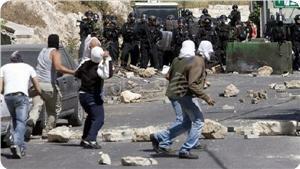 IDF (Israeli army) forces ... fired towards the suspects (and) hits were identified," the army said in a statement. The army did not specify what weapons were used to fire at the suspected Hezbollah members. The incident came just over a week after reports that Israeli warplanes bombarded a Hezbollah position on the Lebanese-Syrian border. Israel neither confirmed nor denied carrying out the two Feb. 24 strikes, with Prime Minister Benjamin Netanyahu saying Israel would do "everything necessary" for its own security. Hezbollah threatened to retaliate for what was the first reported Israeli air raid on a position of the Shiite movement inside Lebanon since a 2006 war between them. Israel is bent on halting any transfer of weapons to its arch-enemy Hezbollah, which has sent thousands of fighters across the border to aid Syrian President Bashar Assad's regime as it battles Sunni-led rebels. Syria has long provided arms and other aid to Hezbollah, and served as a conduit for Iranian military aid to the movement, which battled Israel to a bloody stalemate in a 2006 war. Israel seized the Golan Heights from Syria in the 1967 Six-Day War and annexed it in 1981, in a move never recognized by the international community. 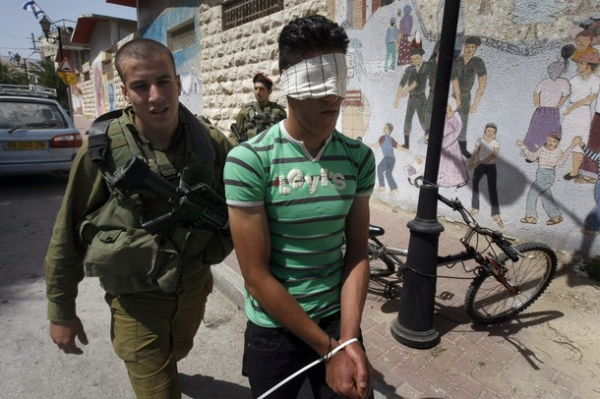 Their names are Jawhar Nasser Jawhar, 19, and Adam Abd al-Raouf Halabiya, 17. They were once soccer players in the West Bank. Now they are never going to play sports again. Jawhar and Adam were on their way home from a training session in the Faisal al-Husseini Stadium on January 31 when Israeli forces fired upon them as they approached a checkpoint. After being shot repeatedly, they were mauled by checkpoint dogs and then beaten. Ten bullets were put into Jawhar’s feet. Adam took one bullet in each foot. 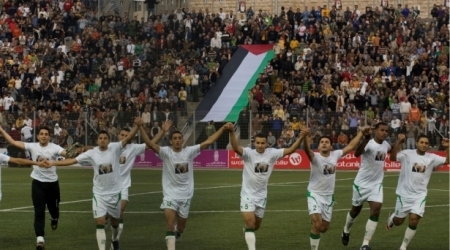 After being transferred from a hospital in Ramallah to King Hussein Medical Center in Amman, they received the news that soccer would no longer be a part of their futures. 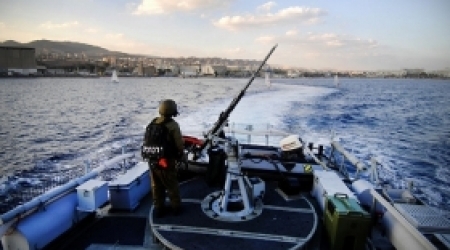 Israeli occupation gunboats fired Wednesday shells at Palestinian fishing boats off northern Gaza Strip coast. The gunboats opened fire at fishermen to push them back to the beach. No injuries or damages were reported. Israeli occupation forces has controlled Gaza waters since its occupation of the area in 1967, and has kept several warships stationed off the coast since 2008. Israeli soldiers handed military orders to 21 families in the Wad Ebzeeq area, in the Northern Plains of the occupied West Bank, ordering them to leave as the army prepares for training. The army ordered the residents to stay away from the area on Wednesday, as the soldiers will be conducting training using live ammunition and shells. Imad Hroub, representative of the Wad Ebzeeq village council, stated dozens of soldiers invaded the area and handed the orders to the residents. He said all residents were ordered to leave their homes and dwellings, and to stay away until four in the afternoon same day. Israeli soldiers frequently displace the Palestinians, especially Bedouin tribes, from their dwellings in the Jordan valley as the army uses those areas for military training, using live ammunition. On February 26, soldiers forced 30 Palestinian families from their homes in the Jordan Valley, and informed them the army intends to conduct training in the area. Aref Daraghma, Head of the Wadi al-Maleh Village Council, said the soldiers forced the residents of Yezra , Deir Ibzeek and Oyoun al-Mayra areas, to leave the home. He added the Israeli military violations led to the displacement of around 400 families over six times, under the pretext of conducting military training. Israeli occupation authorities warned the inhabitants of Khirbet Abzik community on Tuesday evening to leave their homes in the northern Jordan valley for the second time. 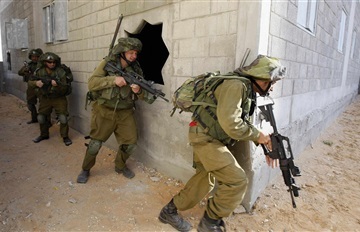 The Israeli occupation forces (IOF) gave holding live-fire military exercises as a pretext to evacuate the area. Head of the villages of Jordan valley council ,Aref Daraghmeh said that the IOF raided the community later at night, warning that they will hold live – fire military exercises on Wednesday morning therefore they have to leave the village. 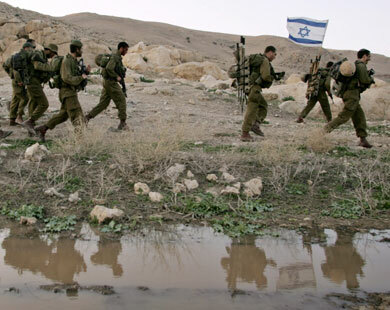 Daraghmeh explained “The military exercises are alleged reason the IOF claimed to evacuate the Palestinian villages in the Jordan valley ,” , noting that the IOF evacuated the village last week. 21 Palestinian families including 150 children will be homeless under the Israeli fires. Some Palestinian Bedouin families live in the village since 1948 whom the Israeli occupation expelled from their homeland. Alkhaddor, Jabarin, Noadjah, Sawafta, and Mhazma are , in origin, Palestinian families from the West Bank. 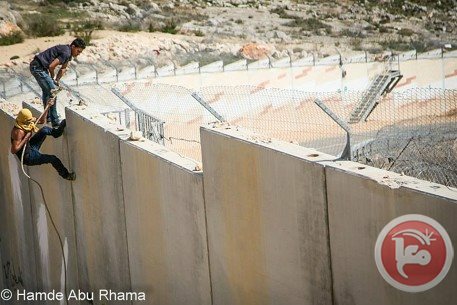 The area of Khirbet Abzik village is 8000 dunams , 5000 dunams of the total area are sized by the IOF as a military – exercises zoon and 1000 dunams are confiscated to build the Israeli apartheid wall. Tuesday Evening [March 4, 2014] Several Israeli military jeeps invaded Borqa village, west of the northern West bank city of Nablus, and attacked several residents; clashes have been reported. The Radio Bethlehem 2000 has reported that the soldiers fired several gas bombs, concussion grenades and rubber-coated metal bullets, while local youths hurled stones and empty bottles at them. In addition, soldiers installed a roadblock at the main entrance of the village, stopped and searched dozens of residents and cars. The army claimed a Molotov cocktail was thrown at a military jeep, near the village. 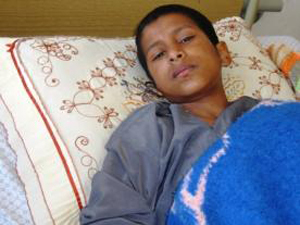 Fadel Abu Odwan, 11, was left alone and bleeding heavily for three hours after Israeli soldiers opened fire on him at the Gaza border fence on February 21. Ramallah, March 4 2014, An unarmed Palestinian child was gravely wounded and left without medical attention for three hours after Israeli soldiers opened fire on him at the Gaza border. On February 21, 11-year-old Fadel Abu Odwan was on his way to help his brother bring in the sheep from their grazing area near the Gaza border fence. Israeli soldiers approached and opened fire on him, leaving him to lie bleeding and unable to move, in full view of the soldiers, for three hours before medical attention was sought. On the way to meet his brother, Fadel had been stopped by three Palestinian officers stationed at their usual spots near the fence. They took the slingshot that he carries for hunting birds and proceeded to play with it, shaking it at the fence and using it to throw stones, ignoring his requests that they return it. Fadel describes how at that point two Israeli military jeeps approached from the other side of the border at full speed. “I started running so fast because I was scared of them and thought they would shoot us. I ran for about 100 meters (328 feet) away from the fence.” He was brought to a halt by the bullet, which passed through his groin and lodged itself in his left leg. He lay bleeding for an hour before he heard an Israeli soldier calling to him, telling him to crawl toward them. When it became apparent that Fadel was unable to move, the soldier went to cut the fence, but was given orders to stop. Fadel was left alone losing blood for a further hour, 150 meters (492 feet) away from the fence and the two Israeli jeeps and a tank stationed there. As it got darker, Fadel heard dogs barking. “I looked around and saw eight black dogs sniffing about three metres (10 feet) away from me. I realised they were about to eat me because they sniffed the blood. I could not defend myself because with every move, I felt excruciating pain.” The soldiers fired shots to ward off the dogs, but no attempts to provide medical attention were made. Fadel is now one of the many children to have been injured by Israeli forces at the Gaza border fence, with the Palestinian Center for Human Rights (PCHR) documenting at least six children wounded and one killed in shootings in the area since the beginning of 2014. Violent confrontations erupted in Aroub refugee camp, north of Al-Khalil, on Tuesday between invading Israeli soldiers and inhabitants. Eyewitnesses said that the clashes started after Israeli occupation forces broke into the camp and fired teargas and sound bombs in its alleys and at houses. They said that the soldiers brutally beat up a young man in the central area of the camp, adding that the soldiers occupied rooftops of a number of houses. Palestinian medical sources have reported that several Palestinians suffered the effects of tear gas inhalation after dozens of soldiers invaded the Barta’a village, south of the northern West Bank city of Jenin. The sources said that the soldiers fired gas bombs, concussion grenades, and rubber-coated metal bullets, causing several residents to suffer the effects of tear gas inhalation. Soldiers also invaded a store in the village, and searched it, causing excessive property damage. The store belongs to resident Zakariyya as-Sa’dy. The soldiers withdrew from the village later on; no arrests have been reported. In related news, soldiers invaded Yab’ad town, near Jenin, and drove around while provoking local residents; no arrests have been reported. In addition, soldiers placed concrete blocks sealing the Ramallah-Jalazoun road, near the central West Bank city of Ramallah, causing a huge traffic jam, and forcing the Palestinian to seek alternate, mainly unpaved roads. Dozens of Palestinians suffered suffocation Sunday due to tear gas in clashes with Israeli occupation forces in Ya’bad Town to the south of the West Bank city of Jenin. Palestinian Security sources said that storming Ya’bad town by Israeli forces led to clashes in the vicinity of al-Masjed al-Kabir (main mosque) and the secondary school; dozens of citizens suffered suffocation. 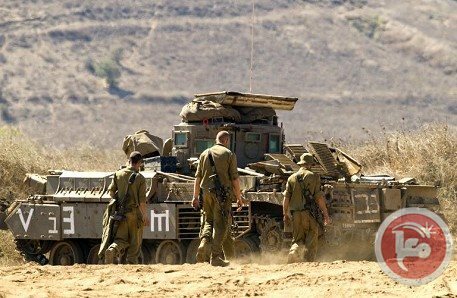 Israeli soldiers, stationed at a roadblock near Hebron, attacked on Tuesday [March 4, 2014] two Palestinian workers heading to work, causing one worker to suffer a broken leg, and kidnapped his friend. Eyewitnesses said several soldiers, stationed at the ath-Thaheriyya roadblock, south of the southern West Bank city of Hebron, stopped and assaulted Ahmad Ali Najajra, 19, from Nahhalin village west of Bethlehem. Najajra was moved to the Arab Society Hospital in Beit Jala suffering a fracture in his leg, and various cuts and bruises. The soldiers also stopped another worker, identified as Ahmad Fayeq Najajra, 20, at the same roadblock, and kidnapped him before moving him to an unknown destination. Furthermore, soldiers invaded Tulkarem city, in the northern part of the occupied West Bank, and kidnapped one Palestinian identified as Sufian Khamis al-Azba, 45. Local sources said that army invaded the al-Aqsa neighborhood in the city, and broke into the home of al-Azba, before violently searching the property. 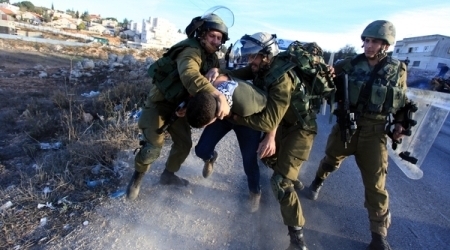 Israeli occupation forces attacked and assaulted on Tuesday Palestinian worker Ahmed Najajra,19, from Nahalin village, southern Bethlehem while going to his work inside the occupied pre-1948 Palestine. Najajra sustained moderate injuries and fractures in the foot as a result of the attack which happened at al-Thaheriya checkpoint to the south of Hebron. He was transferred to the Arab Society Hospital in Beit Jala. Israeli occupation troops raided and searched the Palestinians houses in the villages of Hosan, Nahalin and Bateer. They stormed the houses of Mohammed Najajra, Mahmoud al-Zatma and Fares al-Batha. Witnesses reported that the Israeli occupation forces closed Ramallah road” al-Jalzon” adjacent to “Bethel” colonial settlement by cement blocks, impeding the movement of vehicles. 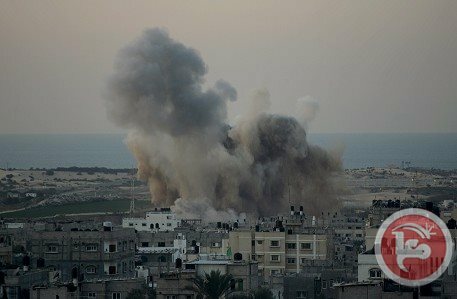 An Israeli air strike on the northern Gaza Strip killed two Palestinians and wounded two others on Monday, the emergency services in the Hamas-run enclave said. Emergency services chief Ashraf al-Qidra told AFP that Musab Moussa al-Zaaneen, a man in his early 20s, was killed in the raid on farmland near the town of Beit Hanoun. He later added that Sharif Nasser, 31, had died of injuries sustained in the attack. The Israeli military spokesman's office said the target was a Palestinian "rocket-launching squad". "Israel Air Force aircraft targeted terrorists preparing to launch rockets in the northern Gaza Strip," it said in a statement. "The mission was carried out in order to eliminate an imminent attack targeting civilian communities of southern Israel." Israeli media had earlier reported a failed rocket attack, with the projectile apparently falling short and landing within the Gaza Strip. On Friday an Israeli air strike destroyed a rocket launch site in Gaza which also represented "an imminent threat," the army said at the time. Monday's strike occurred as Israeli Prime Minister Benjamin Netanyahu met US President Barack Obama to discuss the future of the peace process with the Palestinians. Israeli forces killed six Palestinians and injured 41 in attacks on Gaza in January, al-Qidra said in early February.